With contributions by Andreae C. Bertino, Luca Di Blasi, Andreas Greiert, Sebastian Ostritsch, Ursula Reitemeyer and Katrin Wille. The question about the relation between religion and mediality, especially between religion and writing (scripture) as a medium, appears (self-)evident and alluring. It can all too easily become ensnared in the rash solutions of media determinism, resulting in a history of media understood as parallel to the history of religion. The following paper distances itself from both the predominant phonocentric as well as contrary grammatocentric approaches and chooses another path. It addresses an aspect of phonetic writing neglected until now, namely the silence specific to writing (»Schriftschweigen«), together with the possibility of falling silent, the descending hush in written communication (»Schriftverstummen«). It investigates the prospect of a proto-messianic dimension of phonetic writing, namely »Unschweigen«, un-silence. As I will argue at the end of this paper, these concepts are helpful for a better understanding of the Gospel of Mark, especially the peculiarity of its abrupt end, and to shed light on the Gospel as a genre. So far, it has not been noticed that Walter Benjamin has explicitly rejected Carl Schmitt’s postulate of a state of emergency as early as 1923. In an early draft of the text that was later published under the title Kaiserpanorama in the Einbahnstraße, Benjamin denounces the hope for a state of emergency as an expression of the stupidity and cowardice of the German members of the bourgeoisie who focus so strongly on their egoistic interest in preserving habitual ownerships that they totally ignore the political dangers of Fascism. Benjamin’s reception of Marx, starting in 1927, verifies his own conception of the »state of emergency as the rule« to be dedicated to the protest against oppression and exploitation in capitalism. His postulate to cause the »real state of emergency« then describes a clear counter-position to Schmitt’s reactionary theory of rights. The concept of eternity frequently and prominently appears in Hegel’s works. Yet, Hegel neither gives an explicit clarification of his use of the term ›eternity‹ nor does he offer a fully fledged systematic account (a theory) of eternity. 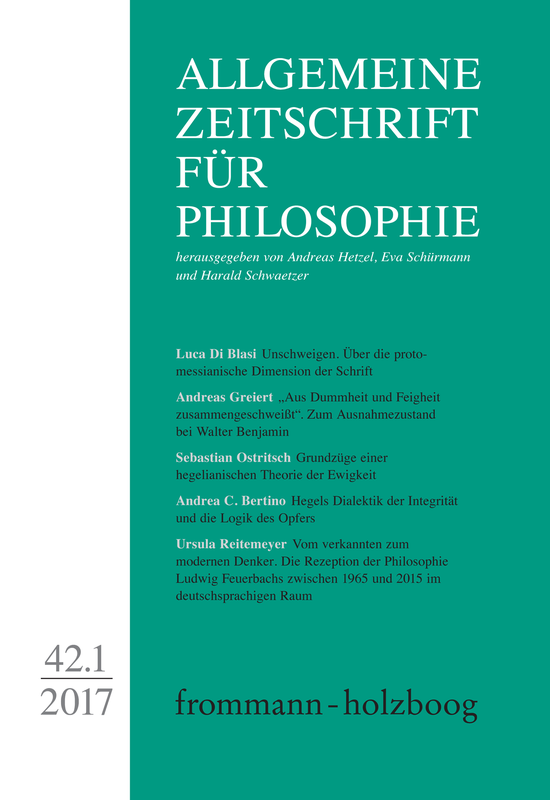 This paper attempts to provide a remedy here by reconstructing the outlines of a Hegelian theory of eternity on the basis of remarks that can be found mainly in Hegel’s Philosophy of Nature from his Encyclopedia (1830). First, I explain and defend the claim that Hegel thinks of eternity as non-successive time that is bent back on itself. Then, I offer a critical discussion of Hegel’s view on how humans may experience such eternity through the religious practice of penitence, atonement and forgiveness. Attributions of personal or moral integrity presuppose self-commitments. These are brought to our attention whenever an agent has to make difficult decisions. It can be seen that in such decisions other interests or moral values and norms of the actor must be neglected or even eliminated. One of the standard language games by which integrity is thought and attributed claims that the person with moral integrity sacrifices himself for something or someone. This can be well understood by using Hegel’s Phenomenology of Spirit. Hegel not only dealt extensively with the concept of a religious sacrifice, he also made use of the semantics of sacrifice for his characterization of the becoming of the spirit. Without having the concept of integrity yet, he used the logic of a sacrifice to comprehend the constitution of the »true« self. With Hegel we can disclose a dialectical concept of integrity as a consistent internalization of the logic of the sacrifice. At the same time we will emphasize the differences between Hegel’s attempt and the use of sacrificial speech in today’s discourse of moral integrity. This article addresses the German reception of Ludwig Feuerbach’s works from 1965 to 2015 exploring the historic and political developments before and after the Fall of the Iron Curtain. Whereas the interpretation of Feuerbach’s philosophy during the Cold War was dominated by ideological struggles between idealism (Hegelianism) and materialism (Marxism), the new Feuerbach-research emphasizes the independence of Feuerbach’s philosophy of religion and anthropology as an ethical concept for post-secular societies. So this short history of the German Feuerbach reception during the last fifty years also mirrors the ideological distance of West and East Germany before 1990 and the scientific approach of both sides after the end of the Cold War. Internationalizing the discourse on Feuerbach has helped to emancipate his philosophy from Engel’s dictum that Feuerbach’s anthropology neither reached the level of Hegel’s epistemology nor Marx’ sociology and was nothing else than old school metaphysics beyond any historic and societal intermediation.